A vacuum pump oil separator filter is also called a separator, an exhaust filter, an oil mist separator or an eliminator. 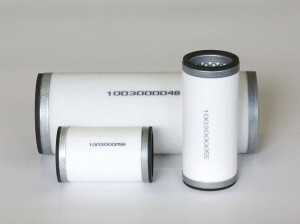 The oil separator filter reduces the oil aerosol content in the exhaust air and is. This filter is an important part of the vacuum pump. The oil separator filter traps the oil that would otherwise leave the pump as exhaust and returns it to circulation in liquid state. The oil content of the exhaust is between 1 to 5 ppm, depending on the oil, vacuum value and some other factors. For the proper operation of the pump change the oil separator filter regularly – at normal operation every 1,500-2,000 operating hours or annually in less frequent operation. The condition (wear) of the oil separator filter (separator, exhaust filter, oil mist separator) directly influences the performance of the pump. Required quantity, for some types even 14 filters are necessary. Each AIR24 vacuum pump oil separator filter is continuously checked during manufacturing and maintaining quality is our number one priority. Save money and request a quote for more than 10 brands, with quick delivery from our central warehouse. We’ve got vacuum pump oil separator filter for Adixen/Alcatel, AIR24, Becker BGS, Busch, DVP, GEV, Oerlikon Leybold, Pfeiffer, PVR, Rietschle and Varian pumps. Please ask us if you cannot find something. Are you looking for a different filter? We can manufacture customised products for you. With using our site, you accept the use of cookie.